Two standing stones situated in an arable field are probably all that remains of a stone circle which may have surrounded an Early Bronze Age Clava Cairn. 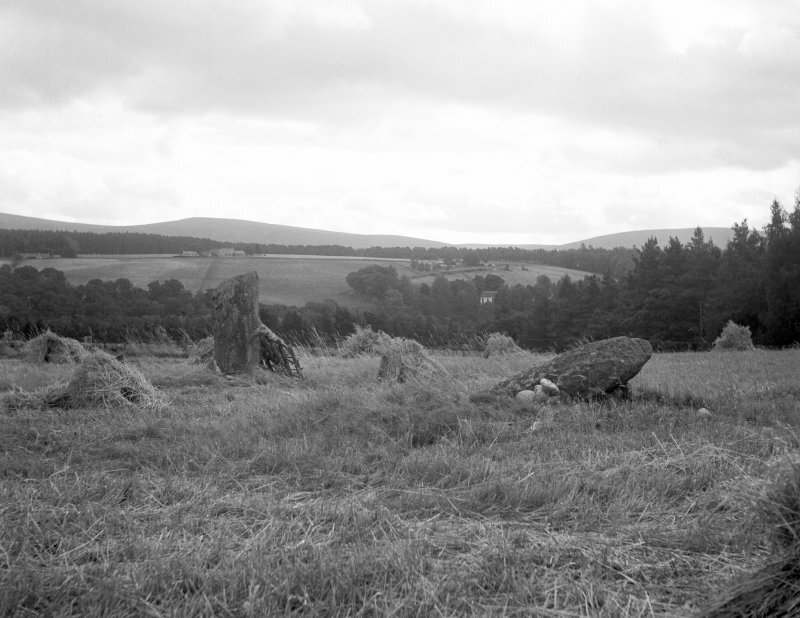 The remains of a stone circle consisting of two stones about 28' apart. A third stone lay at the back of the road dyke (Name Book 1870) in 1870. Both remaining stones are of whinstone veined with quartz, the easterly being a tall rugged block 7'1" high at its south angle, but only 5'9" at its north edge, and narrow at base. The other stone, now fallen measures 10' 4" by 3'8" by 3' thick at one end. The third stone had been used as a chimney piece in the kitchen of Pitchroy (NJ 1770 3796) before being returned to the area. Name Book 1870; F R Coles 1907. All that remains of this stone circle are the two stones described by Coles. Their alignment suggests that they form part of the S and W arcs of the original circle. The pecked circle shown on OS 25"map is thus incorrect, the result of conjecture on the behalf of the OS surveyor of the time. The ground around the stone is ploughed and there is nothing to help classify the site. There is no trace of the third stone noted by Coles. Visited by OS (A A) 3 March 1971. On a small level terrace some 50ft above the Spey, just W of the highroad at a point about midwat between Pitchroy Lodge and Ballintomb, there are two stones, one standing the other fallen. Their bases are 7ft 6in apart, on a line running from WNW to ESE. It is the eastern stone that is still erect; it is 6ft 8in high, 4ft broad and 1ft 3in thick. The true hieght of the fallen stone - measurable as its foot is exposed - is 8ft 6in; it is 3ft 6in broad and 1ft 6in thick.